KOTTAYAM, India—Higher prices have contributed to a significant pickup in India’s production and export of natural rubber, the country’s Rubber Board has reported. Production during the last fiscal year reached 690,000 metric tons, well above a forecast level of 654,000 tons and 22.8 percent above the 562,000 tons recorded in 2015-16. NR production this March in India reached 55,000 tons, 66.7 percent above the level in the same month last year, the Rubber Board said in its April 24 news release. Indian NR exports during last fiscal year came in at 20,010 tons, compared to only 865 tons in the preceding year. Likewise, March exports reached 4,562 tons, against only 33 tons a year earlier. The board linked the rebound to higher prices in the international market. “The increased production of NR is the result of improved market price and a number of initiatives taken by the board at field level, including mass contact programs to improve production and productivity,” the Rubber Board said. According to the industry body, measures such as training helped in bringing confidence among growers and, as a result, more holdings came under tapping. 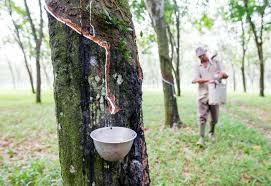 Last year 10,000 people were trained in rubber tapping, with another 22,000 to go on a program in the coming months.